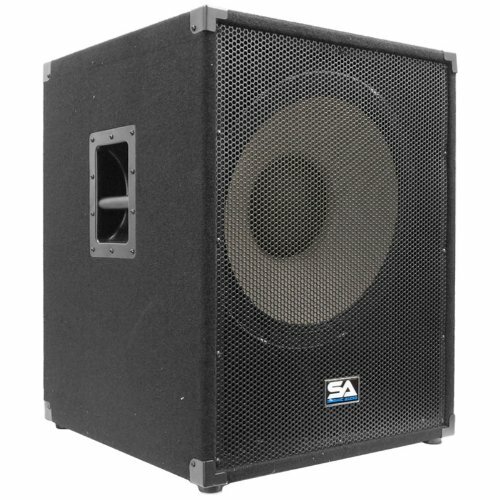 Pro Audio Professional 18" Subwoofer Cabinet - Model - Enforcer II, Subwoofer - 18" 120 oz. magnet 4" Voice Coil . , 1000 Watts RMS - 2000 Watts Peak, Wired at 8 ohms, 45Hz - 20KHz, Sensitivity: 101 db., 5/8 Plywood, Black carpet with black metal corners, Recessed Metal handles, Metal Speaker Pole Mount on Top, Metal Jack Plate with two 1/4" & two Speakon inputs, Can be Daisy Chained, 28" tall - 22" wide - 22" deep, 90 lbs. per cabinet, These speakers are brand new., One year warranty. This listing is for one 18" subwoofer cabinet. You will receive one 18" sub, pictured and described above.